CONSTANT LEGAL BATTLES – First Nations are always having to go to court to fight for what is theirs rightfully – and they almost always win, says historian Dr. Ken Coates, seen speaking Saturday in Whitehorse. 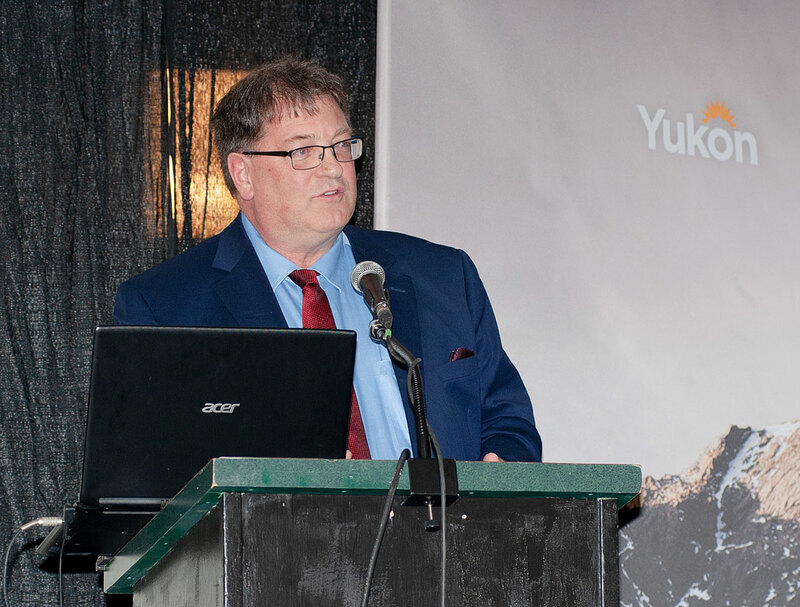 Dr. Ken Coates told delegates attending this year’s 46th Annual Geoscience Forum that the Yukon offers the world a story of success in the art of treaty-making. And the world continues to watch. Coates told the mining industry Saturday it’s on the front line of reconciliation. Raised in the Yukon from Grade 3 through high school, the historian and professor at the University of Saskatchewan said he can see the success from where he’s sitting outside the territory. He remembers back to 1973, when local Indigenous leaders came to speak to their Grade 11 law class at F.H. Collins Secondary School. The class was mostly white students, because in those days, many of the aboriginal students had already dropped out by Grade 11. His Grade 8 class was about 30 per cent Indigenous, but that had fallen to just a fraction by Grade 11. It was the year local First Nation leaders went to Ottawa to deliver Together Today for Our Children Tomorrow to then-prime minister Pierre Trudeau. It was the year the federal government agreed to restart negotiations to establish modern day treaties, and Yukon First Nations were first in line. Coates told the representatives of mining companies and others in the geoscience audience they are on the front line of reconciliation. When the Truth and Reconciliation Commission began its work, the professor was not optimistic. He’s much more so now. The commission, Coates told the audience, linked all the dots, it linked residential schools to poverty and multi-generational social issues. It tied in the impact of creating reserves, and the Indian Act. The late Johnny Johns of the Carcross-Tagish First Nation was a famous big game hunter, but if he wanted to get an official licence, the Indian Act required that he renounce his heritage, to say that he was Indian, Coates told the audience. He never did. Prime Minister Justin Trudeau has built the foundation for his government on fostering improved relationships with First Nations. The mandate letters to his ministers emphasize their work must be embodied with building those relationships, he said. Coates said there is still much work to be done. He recalled how he was called to testify in the recent case of B.C. challenging the rights of the Tsilhqot’in people. B.C. argued the Tsilhqot’in had no organized society, no structure, no leadership, Coates said. Coates said First Nations are always having to go to court to fight for what is theirs rightfully, and they almost always win, he said. Coates said the small First Nation spent between $10 million and $15 million fighting their case – money they didn’t have. He doesn’t know what the federal government spent, but it was multiples of the what the Tsilhqot’in spent. Coates said National Chief Perry Bellegarde of the Assembly of First Nations refers to six, and 66. Sixth is Canada’s standing in the world when it comes to quality of living. If you were to put all of the country’s First Nations together, they would rank 66th, he said. But things are changing, he assured the audience. Coates said First Nations are emerging with strength, in particular financial strength. There are First Nation development corporations in Canada today with assets in the billions, and many with assets in the hundreds of millions, he said. Coates said development corporations are reaching out to Australia, New Zealand and Taiwan looking for investment opportunities. There is a probability the Trans Mountain Pipeline expansion project will go forward with First Nations as the major shareholders, he said. Coates said the remarkable tenacity of aboriginal people deserves respect. You don’t have to look far in the Yukon to see First Nations becoming big players on the economy. Modern treaties have laid the foundation for fruitful partnerships between First Nations and the private sector, the resource sector, he said. “You are on the front line of reconciliation,” Coates told the audience of mining executives, geologists, biologists, representatives of the service and supply sector. Treaty your OWN LAND!!! YENYEIDI territories will forever remain under TLINGIT JURISDICTION!! We are Sovereign in our ancestral lands. FOREVER. If Kanada wants something from our territories, come and negotiate how we share, IN GOOD FAITH, not SNEAKILY by way of land grab agreements AKA treaties!!! The term " first nation" is insulting and racist. It implies entitlement and priority. Indigenous people ( whatever that means) are not the first nation, our limited ability to look back at time only scratches the earths 4 billion years of existence. It's time to recognize we all have equal rights and it's time to scrap the entitlement attitude. Oh and by the way it's 2018 not 1969. Coates presents a nice, shiny package. But, the hard cold truth is that First Nations, in the Yukon at least, have essentially been given veto power over any development while also trying to maintain a stranglehold over economic opportunities in certain areas (e.g. the Peel). Invariably, the price for this is a premium on any development in the Yukon. One can argue this is a just outcome. One can also argue that this policy deprives the broader society of equitable access to resources as envisioned in the UFA and individual settlement agreements. I also fail to see the First Nations feeding the benefits of this new economic and resource arrangement model back to its own people - except for the benefit of a few. Its seems modern Treaties are similar to what the hunter Johnny Johns got cornered with.. A lifetime ban on being who we are. If this is a propaganda advertising for selling out.. Then this is a snake in the grass.. There is no such thing as a modern treaty, that's the problem with mainstream Canada, always trying to change what they think is good for FN people. Our Treaties are fine.. CANADIAN government is not and must live with the Treaties.. Corp or not! The other JW.....to that I would agree. Also too the virtue signaling Mecca. Think we are also a top model for transfer payments and photo ops.